In December 2017, Penal Reform International signed an agreement with the UN Multidimensional Integrated Stabilization Mission in the Central African Republic (MINUSCA) to provide support in developing a strategy for demilitarisation of the prison service. MINUSCA has been working in Central African Republic since 2014, supporting efforts to address the root causes of conflict and establish lasting peace and security in the country. The aim of PRI’s project is to establish a demilitarised prison system under civilian control, that is respectful of national laws and international human rights standards, and which provides a safe, secure and humane environment for people deprived of their liberty, including preparing prisoners for their release and social reintegration while serving a sentence. PRI will help develop a national strategy, backed up with an implementation plan, for demilitarisation of the prison service, and will help to draft standard operating procedures in line with national legislation and international standards. As the first step, an introductory visit took place in January 2018. PRI’s Executive Director Alison Hannah, together with PRI’s Middle East and North Africa Deputy Director Haitham Shibli, met with a number of national and international decision-makers, accompanied by two independent international experts in penitentiary systems, Jean Charles Paras and Franck Gorsch-Chacou. The country faces many challenges in establishing an effective criminal justice system and safe and secure prisons. However, many achievements have already been made, including renovation of some prison buildings, recruitment and training of civilian prison staff, improved record-keeping for prisoners, and the creation of a special criminal court, which is expected to start its work later this year. 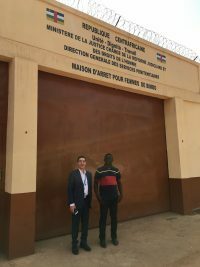 While in Bangui, PRI visited the Ngaragba Central Prison and the women’s prison in Bimbo. The Central Prison is undergoing some renovation and has already set up a market garden for prisoners to grow vegetable and salad crops to supplement their diet as well as provide vocational training. 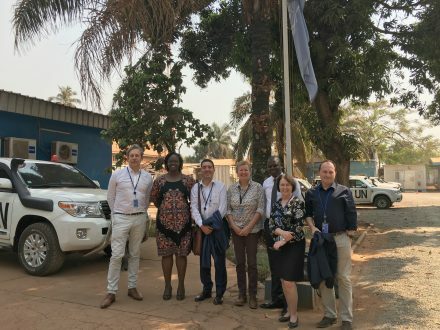 Discussions were held with the MINUSCA Corrections Unit (who organised the visit and introduced PRI to key stakeholders), the Minister of Justice, the Ministry of Defence, the Director General of the Prison service, and international donors and experts, including human rights experts. Further visits will be needed to meet with key decision-makers. These will enable us to agree how best to provide a framework for change so that progress can be made in the criminal justice and penitentiary systems to achieve a holistic and integrated prison service under civilian control. Inset image: PRI’s Haitham Shibli at the women’s prison in Bimbo.